The knowledge that we’ll be getting up at 3:30 in the morning to go to the airport and we’ll be enroute home for 30 hours makes this last day especially precious. 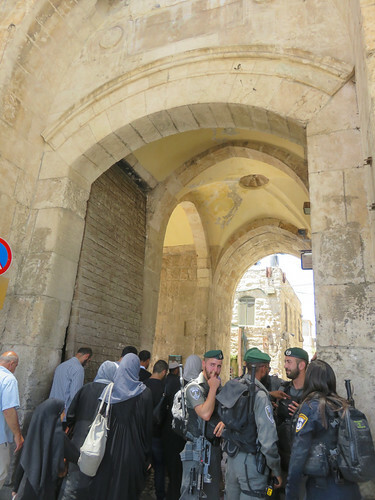 We enter the Old City through the Muslim quarter at the Damascus gate, where there’s been a suicide attack on soldiers a few days ago, also mindful of the recent terrible incident in Manchester England. 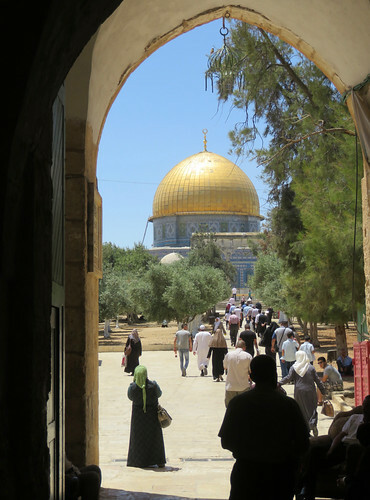 Today is Friday, and crowds are already making their way to the noon worship at the Dome of the Rock inside the Temple Mount or Haram Esh Sharif. 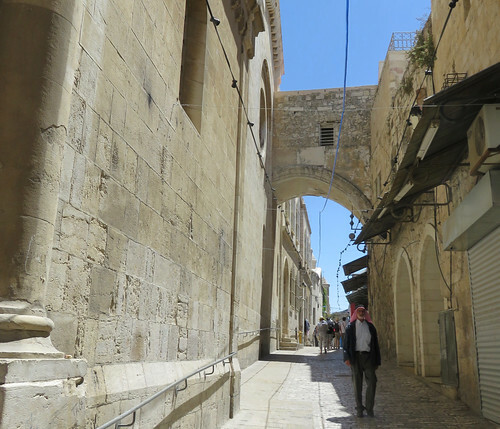 Without a destination in mind, we turn left at the Via Dolorosa and head for the Ecce homo arch, the remainder of a gateway erected by the Emperor Hadrian in 134 CE, who was rebuilding the City after a second Jewish rebellion against the Romans, following the one in 70 CE that had led to its destruction by Titus. 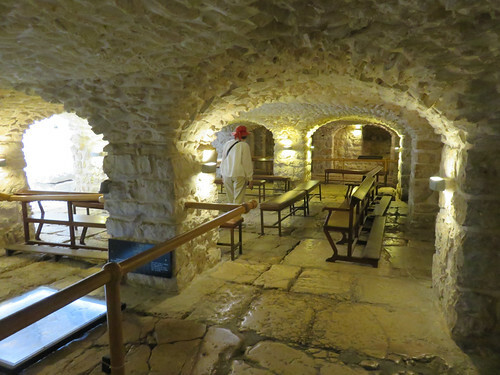 This is alleged to be the place that Pilate imprisoned Jesus and then presented him to the crowd. We enter a small doorway to the left which leads to a large complex managed by the Sisters of Notre Dame de Sion. A person at a desk says that we can see the Basilica before Mass begins in a few minutes. 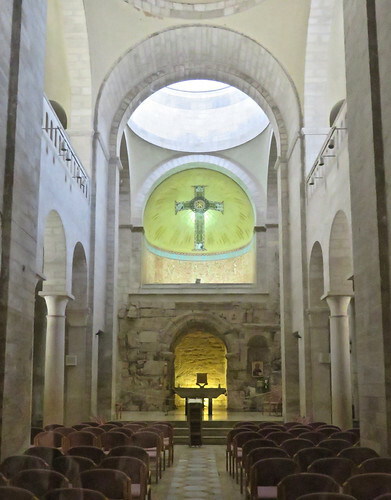 Though relatively small and built in the 19th century, I’m entranced by its harmony of half circles and straight lines, its proportions, colors, and textures, its pairing of the geometrical cross in the luminescent green apse with the ruins of an ancient arched wall below. We return to the desk and learn that this place also includes an underground archaeological site. A slick set of stone stairs leads down to an opening 40 feet deep at the bottom of which is the entry of an aqueduct built by the Hasmoneans in the second century BCE bringing water that was stored in a vast cistern called the Struthion Pool. Opening out from the staircase is an endless expanse of vaulted chambers arising from a stone floor which was added by Hadrian to cover the pool and turn it into a open air plaza, known as the Lithostrotos, which was later covered by the chambers. We could stay in this place for hours exploring its gardens, guest accommodations, and rooftop observation platform, but we need to keep moving. 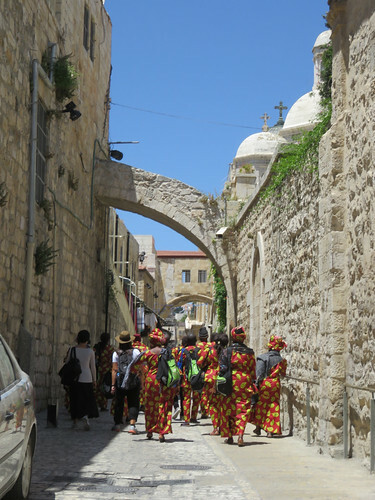 Passing a group African Christian pilgrims going the opposite direction, we head for the Lion’s Gate at the end of this street through which crowds of Muslim worshipers are heading for the Dome of the Rock. Suddenly to the right an archway opens with a spectacular view of the Dome, and I beg the soldiers on duty for the chance to just take a look and a picture, which they grant. We head back the way we came, hearing the call to worship and look for a place for lunch that’s not one of the crowded noisy cafes along the main street, El Wad. 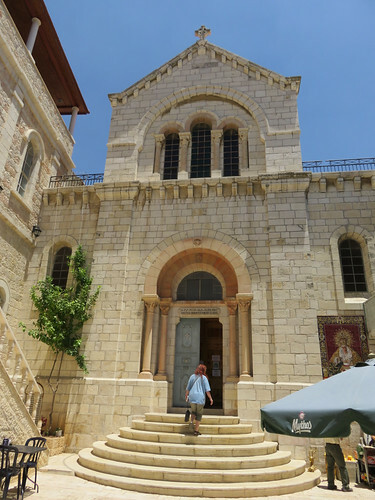 Outside of a gateway to the dazzling courtyard of an Armenian church, there’s a menu. 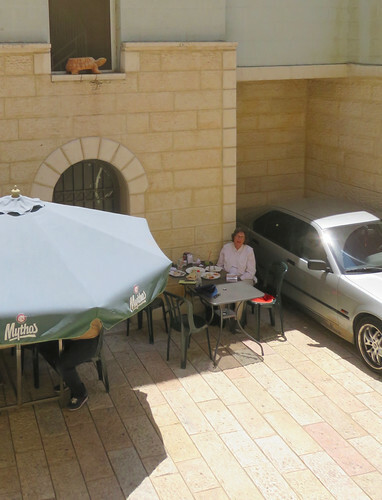 We walk inside and are seated in a shady corner with all-around views of this peaceful complex and enjoy a memorable meal of salads, grilled lamb and chicken, eggplant, humous and something like pirogis. Reentering the street, we encounter the crowds leaving the Haram Esh Sharif. To elude them we make a quick right turn heading back to the Christian quarter and stop for a half hour of Buddhist meditation in the Lutheran Church of the Redeemer. Then it’s back into the David street Market where Jan hones in on the spice merchant and hat seller we saw yesterday to shop for our gourmet cooking son and daughter-in-law, for inexpensive earings and for a hard bargained little Bedouin hat. As we emerge into daylight at Jaffa gate, I cant bring myself to leave yet. We turn left toward the Armenian quarter and are denied entry into an enticing garden. A small entrance opens again to the left into a crowded courtyard. Young men in dark robes disappear behind two heavy leather door coverings, and one of them beats a hanging plank reminiscent of the call to worship at Tassajara Zen Center. 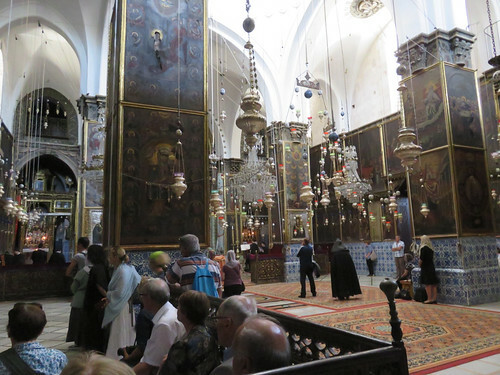 We’re emboldened by other tourists’ slipping behind the door coverings and find ourselves in a gorgeous cathedral bedecked with carpets, tilework, chandeliers, immense paintings and hundreds of beautiful lamps suspended on long chains from the ceiling. Choruses of men sing antiphonally, and long bearded priests dressed in sinister black capes and hoods enter scowling through the crowd of gawking tourists to which we belong. 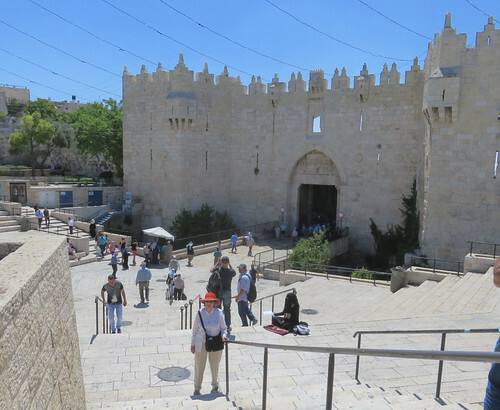 The combination of mystery, wonder and irreverence seems a fitting end to our Jerusalem stay. This entry was posted on Friday, May 26th, 2017 and is filed under Excursions, Israel 2017, Miscellaneous. You can follow any responses to this entry through the RSS 2.0 feed. You can leave a response, or trackback from your own site.